There’s an ever expanding aspect of thru hiking that has directly connected us to the rest of the real world. Technology has brought the world to us at the tip of our fingers by the touch of a button or screen. We can FaceTime video call with folks across the globe instantly anywhere we have decent service. Or check into our favorite AYCE trailside buffet on 4Square. Share a selfie with the world on Instagram, instantly. But when is it too much trail technology and not enough trail beauty? This can apply to hiking or any outdoor activity. Honestly it could apply to our entire lives because we have simply been flooded with technology. With the ever evolving network of social media, more and more people are seeing what day to day life is like on the trail. And they are doing it in real time. I’m not going to lie, I thoroughly enjoy The Real Hiking Viking(TRHikingViking) on Snapchat. He shares pictures and hilarious videos of his winter solo SOBO AT thru hike. You should join Snapchat for his account alone. He’s absolutely killing it. There are so many options to choose from; Snapchat, Twitter, Facebook, Instagram, Periscope, Yonder and Google+ to name just a few. Speaking of Instagram, h/t to Kira Thornley for putting together this awesome list of our bloggers to follow on IG, myself included. How is a hiker to choose what platform is best? How does someone balance their immediate enjoyment with sharing their views with the interwebs? 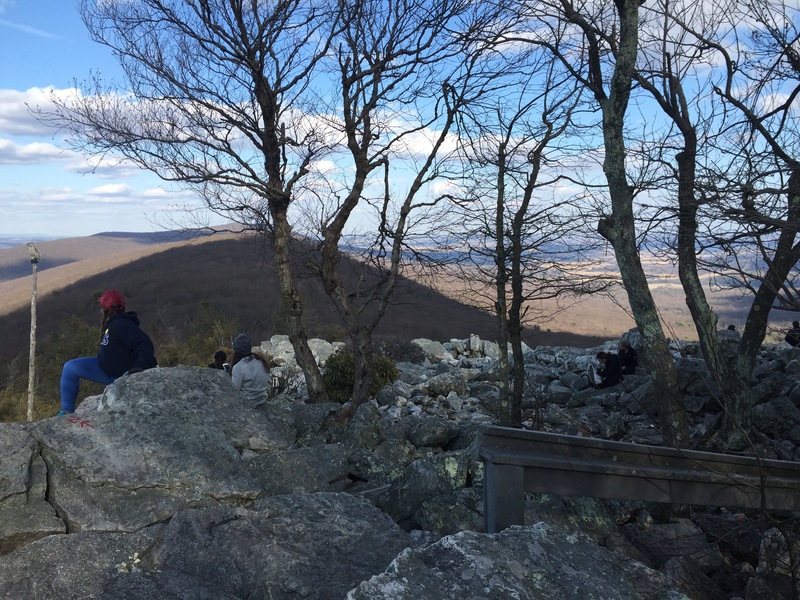 On a shakedown hike last weekend, at Hawk Mountain Sanctuary, I had the chance to see prime examples of what I personally am trying to avoid. As we approached the North Lookout we could see a several small groups of 2-3 people sitting around. The view was pretty amazing even for the dull March colors of winter. I took a few photos of some of the day hikers (phones in hand) to illustrate my point. (Yes I absolutely see the irony in my using technology to make my point about not using technology.) Nearly all of them were on their phones Facebooking or Tweeting something about how awesome nature is. They were talking about selfies and checking in on Facebook. I will say we saw a middle aged couple I regrettably didn’t get a picture of. They were having lunch on a blanket and enjoying the view. Good on them for making the most of their trip. I recently received a rather blunt(and justified) comment that brought me crashing back to reality after a brief moment of juvenility(<-I can’t believe that’s an actual word) over an Instagram follow. I was reminded that in the end we need to focus on the adventure in front of us and making the most of it. Not to mention we need to be living in the moment before it is gone. Life moves pretty fast. If you don’t stop and look around once in a while, you might miss it. My final senior year of college, I arrived for the fall semester and immediately informed my professors that I would be taking a vacation the following week. Yes I had several senior years of college, don’t judge. The puzzled and confused looks were astounding. 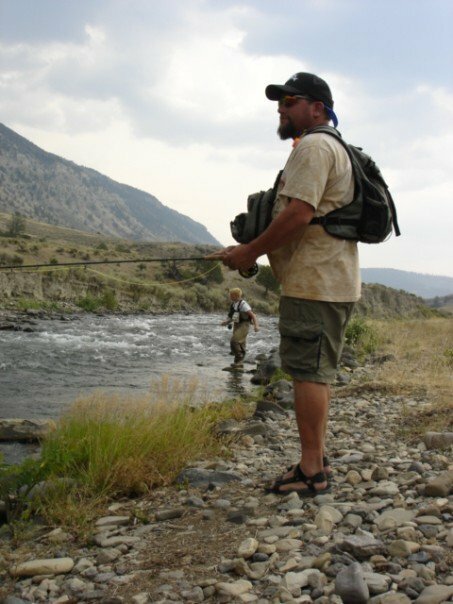 On this trip I joined some family friends in Montana, Wyoming and Idaho on a week long fly fishing adventure. An absolute once in a lifetime, dream come true vacation for me. Being the technology nerd I was at the time I took nearly 1500 pictures. Emptying my memory card daily onto my laptop. 1500 pictures I then sorted through and found the best of the best and of course uploaded them to Facebook for my friends to enjoy. Since then I have looked at them maybe twice in 8 years. Only because I was looking for specific pictures for one reason or another. Looking back now only 10% of the picture I took even made it as far as Facebook. How much time did I waste taking photo and dealing with them when I should have been enjoying paradise? Connor put together an awesome article looking back at his own thru hike and how frequently he was photographed actually taking photographs. He was letting his digital life take away from his amazing adventure. Check out his article Nice View? Put the camera away! It’s a great warning to potential thru hikers, and everyone else stuck in the black hole of social media and technology. There’s no single black and white answer for what the sweet spot is with sharing your time in the outdoors. Some folks like to take pictures and some folks choose to write about their experience. I find myself taking more pictures of scenery and my dog than of myself. Aside from a few amazing shots I have and covet. I have a lot of wasted memory on cards that have gone through the washer. Not to mention the time wasted dealing with said photos. I enjoy writing and sharing my experiences and perspective on what’s happening in my world. I’m still trying to find my balance. I hope my balance allows me to maximize my enjoyment in the field and share my experience once I am able to reflect back on them. By using my Fujifilm XP200 instead of my iPhone I can take better photos and keep the internet tucked away. That is my goal. Before we jump on the elitist bandwagon of no technology on the trail, we need to understand our own expectations of this technology. Some folks want to have followers and likes. I think you can buy some according to some spam I’ve gotten. But there are some of us that want to have genuine interaction with folks because of shared interest and mutual goals. That’s what we need to concentrate on. In the end we need to appreciate the time we have while it is happening. We need to separate ourselves from the world of the internet and get back to enjoying our time outdoors, and our lives in general. We only get one shot at it, let’s use it wisely. What’s your reason for being active on social media? What platform works best for you? How have you found your sweet spot while afield? Post your thoughts in the comments below. My senior year was 3 of the best years of my life!